The healing properties of citrine are some of the most powerful to wear and connect with on a daily basis. Citrine properties make it the best stone for creating your dreams, bringing positivity into all situations and amplifying the intentions of other jewelry and stones. Natural Citrine is a premier stone of manifestation, imagination, and personal will. Carrying the power of the sun, it is warm and comforting, energizing and life giving. It stimulates the chakras like the sunlight of spring, clearing the mind and stirring the soul to action. Its frequency awakens creativity and imagination, and sustains the process of transforming dreams and wishes into tangible form. With its pure yellow energy, Citrine encourages fullness of life, fresh beginnings and new pursuits. Natural Citrine does not hold or accumulate negative energy, but rather transmutes, dissipates, and grounds it, making it extremely protective for the environment. It works out problems on both the physical and subtle levels, transforming negative thoughts and feelings into positive ones. It is one of only two crystals on Earth that never needs to be cleared or cleansed. Citrine is a transparent, yellow variety of Quartz, ranging in color from pale to golden yellow, honey or almost brown, and may contain rainbow or sparkle inclusions. The name comes from the French word citron, meaning lemon. It was used as a gem in Greece as far back as 300 B.C., and because of its color, is sometimes mistakenly referred to as Gold Topaz, Madeira or Spanish Topaz, or Safranite. Much of the commercial Citrine on the market is heat-treated Amethyst or Smoky Quartz that produces an enhanced Citrine color, usually a deeper amber or orange-reddish shade. Most Natural Citrine is a pale yellow color. Removes negativity from the mind and clears the mind of suicidal thoughts. 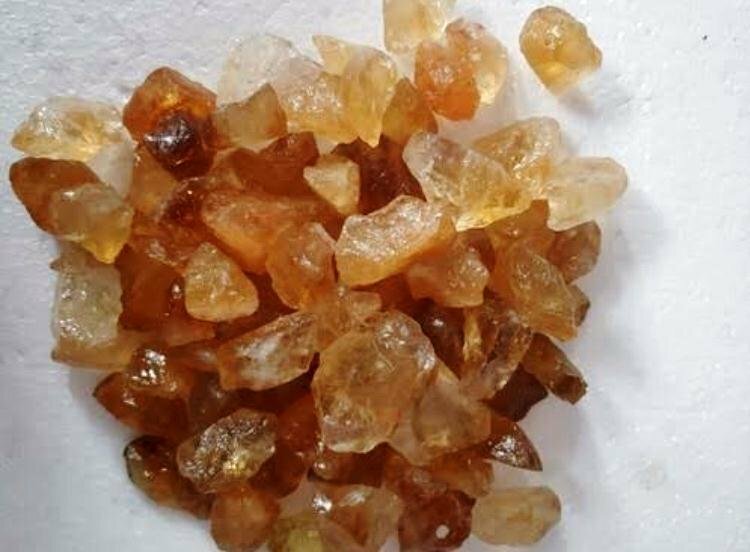 It also helps fight depression in the wearer’s mind.This is also called as success stone and people are wearing it to bring prosperity and wealth into their lives.Called as merchant’s stone, citrine stone is believed to keep the cash box flowing with money all the time. If this stone is kept in one’s wallet, it controls the spending habit and saves money. The citrine stone has amazing healing properties and remedies the diseases of the heart, liver, urinary system and kidneys. Citrine gemstone can enhance immunity and improve digestion. It can remedy sleep disorders and thyroid related problems. It helps improve relationships and promotes harmony. While some stones can absorb negativity, citrine stone is known to dispel all negativity from its environment.